I was just looking through my emails and I found an incredible article (at least to me) in Family Handyman. It’s photos of some of the most sensational and unique homes from around the world. I found it so fascinating and thought I would share some of it with you! The first one that caught my eye was the Tile House in 29 Palms, Ca..because it is so close to me. I remember going there, back when I was in high school. This is how it looks now! Can you believe they rent out the home for $179 a night! 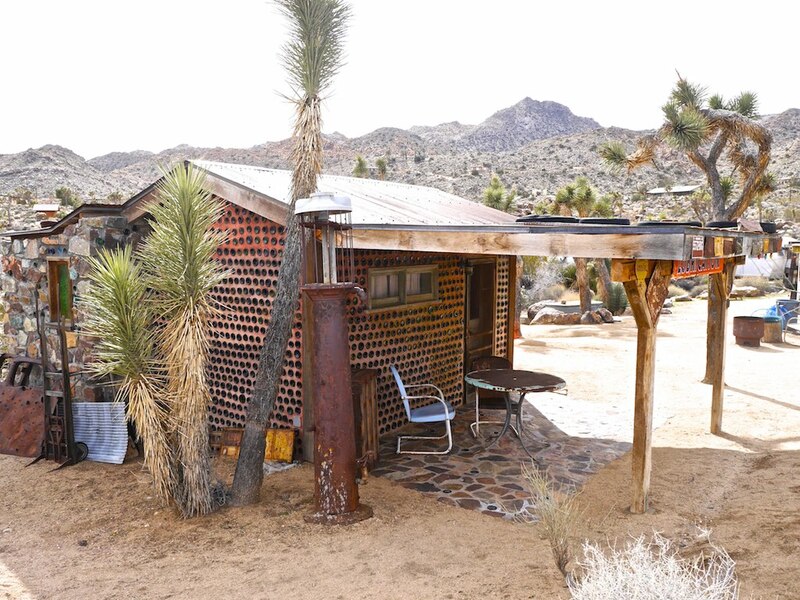 Outside of Joshua Tree in California, travelers can revel in the visually stunning tile house that will have them inspecting the tiniest of details. The tile house is a mix of Mexican tile, smalti, handmade Perry Hoffman ceramics, tile and fused glass, found objects and stained glass. Lots of creative people in my neck of the desert! The Spaceship Home is a prefabricated home that takes 14 weeks to construct. The 1,033-square-foot home contains an airplane staircase in the same vein as the Futuro. It’s made of solid wood modules that rest on a metal structure that rises 13 feet off the ground. Features of the home can be controlled from a mobile device, so it comes as a smart home. The Futuros, as seen in this photo, have airplane doors that fold down. This is the first Futuro manufactured after the prototype and is on display in Espoo, Finland at the WeeGee Exhibition Center as part of the 50th birthday of the Futuro. The Sanzhi UFO houses, also known as the Sanzhi pod houses or Sanzhi Pod City, located northwest of Wanli District , were a set of abandoned and never completed pod-shaped buildings in Sanzhi District, New Taipei City, Taiwan. Suuronen also created the Venturo, which these structures bear a close resemblance. His design served as inspiration for a plastics manufacturer in Taiwan. The site was owned by Hung Kuo Group and construction started in 1978 but the project stalled in 1980. The houses were demolished in 2010 to make way for a seaside resort and water park. The Futuro used a four-legged base that claimed it was adaptable to any terrain — from flat ground to a 20 degree incline — in marketing material. Futuros are known to drop into different towns. This one appeared in France in early July. Now….leaving the futuristic space homes and entering other awesome ideas other people came up with when designing their ‘perfect home’. This is not Big Birds house, but it sure looks like a big nest. The inside is quite different than its outside presentation. The Bird’s Nest is part of the Treehotel compound in Sweden and well-camouflaged with branches secluding the view. Inside the treehouse is pure luxury with its circular design. Look at the geometry of the Healdsburg Treehouse combines in a five-level treehouse will keep your mind working in a meditative setting. The Healdsburg uses reclaimed Douglas fir in its construction. Wow, speaking of using recycled material in your creativity! Jonathan Juhasz took an old grain silo he found on Craigslist to begin building this treehouse. He added in a repurposed galvanized steel water trough for the doorway and included fiberglass bench seating that he repurposed from a bowling alley. One of the cooler features is a slide, a perfect escape hatch for an emergency landing. Look at these cubicles in the Netherlands! Architect Piet Blom designed a series of cube houses in the Netherlands set at an angle to optimize the space inside. These are located in Rotterdam and there are others in Helmond. The houses are around 1,000-square-feet and are meant to resemble an abstract forest. Does this look like a forest? The Dancing House (nicknamed “Fred and Ginger” because it resembles two people dancing like Fred Astaire and Ginger Rogers), designed by architects Vlado Milunić and Frank Gehry in Prague, rose up from a spot that got bombed in 1945 by the U.S. Vaclav Havel, a dissident when the former Soviet Union controlled Czechoslovakia and the first president of Czechoslovakia following the Velvet Revolution that led to the country’s independence, lived next to the site growing up. Havel supported the project when Milunić first talked about it. The building contrasts the pristine Gothic, Neo-Baroque and Art Nouveau buildings throughout the city. It’s also a response to the Eastern Bloc buildings that sprouted up during communism. It signals a shift from rigidity. Gehry came on board for the project and ING, which owned the adjoining building, funded the project. The project started in 1994 and completed in 1996. It’s said to be deconstructivist architecture, which moves away from symmetrical design. The Crooked House is an irregularly-shaped building filled with shops, bars and restaurants. It’s a little whimsical but it’s also a building with expression following the lifting of the Iron Curtain over Poland. It was built in 2004 by Szotyńscy & Zaleski, who were inspired by fairytale illustrations. Đặng Việt Nga designed and constructed the Hằng Nga guesthouse in Vietnam, which has attracted attention since its opening in 1990. From the outside it looks like a giant tree but it gets pretty surreal after that. It gets described as a fairy tale house and it uses few right angles. It boasts 10 themed guest rooms like a kangaroo room and an eagle room. So, what do you think? Would you like to live in one of these houses? I love the first one! So colorful! It’s so close. It’s so dejavu seeing them on the internet! The Tile House is so colorful. The tiles are so old. I saw it back in the 70’s….very colorful! Than you for checking out my post! I want to live in the gnome home! You would! Not to sure there is enough room for all your crochet! hahaa.. it sure is cute! How about a crafting room, that looks like a mushroom? Or perhaps another little house. FAscinating creativity. We had a Futuro here in Adelaide. I believe it is still in the state but has been relocated. It caused quite a sensation when it first arrived. What I find interesting now with the pressure of increasing homelessness the great innovative housing that has popped up. Repurposed shipping containers. Mini houses on wheels so they are mobile and fully functional, Mud brick and straw houses. There is even a fellow in the US somewhere who makes kerbside single room shelters out of repurposed materials and junk. Fully lockable cute little homes. I love all of the quirky houses! How fun would that be to live in one? ….as long as it has modern kitchen inside! The first one it is for me! Your going to have to fight for it Ute! Great post! I love the one in 29 Palms the best! I have seen that one and the bottle house. Boy, that was a long time ago! I was thinking of asking my husband to put tiles on the sides of my front steps! Love the look! Valerie, that’s a wonderful idea! Instantly adds appeal to your door! How inviting!